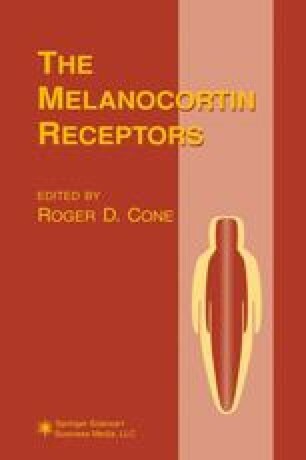 This chapter deals with perhaps the least understood receptor for the melanocortin peptides, that is the melanocortin-3 receptor (MC3-R). Although naturally occurring and genetically engineered mutations have provided us with insight into the function of the other known melanocortin receptors, little is known about the physiologic role of the MC3-R. Therefore, in order to further our understanding and potentially ascribe a function to the MC3-R, I will review the literature which describes the cloning and tissue-specific expression of the MC3-R gene. Particular attention will be paid to the neural expression of the MC3-R, as well as the pharmacological characterization of this receptor in vitro as a “γ-MSH” melanocortin receptor. Additionally, I will review the recent data, which describes the pharmacologic interaction of agouti and agouti-related peptide with the MC3-R. Finally, I will describe in vivo data which convincingly demonstrates one physiologic role of γ-MSH in mediating the response of reflex natriuresis. Since introduction of antagonists of the MC3-R potently block the natriuretic response induced by γ-MSH, one likely physiologic function for the MC3 receptor has thereby been identified.